Oast Quilters is pleased to be able to organise a variety of tutored workshops throughout the calendar year. Hopefully, there is something to please all tastes on the programme, but if your area of interest is not covered, please contact the programme secretary (currently Mary Cunningsworth), who will endeavour to find a suitable speaker/tutor for the future. The tutors for ‘External’ workshops are usually nationally, if not internationally, known in textile/quilting circles and we are privileged to be able to learn from their expertise at a rate which is much less than usual charges. ‘Internal’ (or in-house) workshops are tutored by our own talented members. External workshops cost £20.00 for the day and internal ones cost £15.00 for the day. Workshop attendees must check the list of requirements before attending the workshop so that they can have the full benefit of the day. The lists of requirements for each workshop can be found on the website. The location for the workshop varies so members must check before setting out. 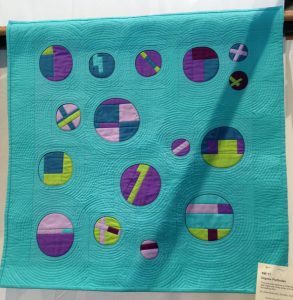 Obtain a workshop booking form from the Members’ table at each Oast Quilters meeting or by downloading here Workshop-booking-2019.pdf. A paper copy must be completed and submitted with the full payment for the workshop(s) booked. No deposits are required/accepted. Verbal booking is not accepted. The only way to book a workshop is by submitting a booking form. Members may book individual workshops throughout the year or book all that they wish to attend in a single submission. Although immediately bankable payment (cash, or a cheque made payable to ‘Oast Quilters’) is much preferred administratively, post-dated cheques will be accepted. Any such post-dated cheques must be dated a month before the pertinent workshop. Place the completed form with the payment into an envelope provided and post into the black box on the Members’ table or contact the workshop organiser (email: oastworkshops@gmail.com ) to obtain a postal address for submission. If a member requires the workshop details and requirements to be sent to them by post, this will only be done if the member puts a stamped addressed envelope in the booking envelope. An acknowledgement/receipt will be sent by email unless an SAE is provided. Members should contact the workshop organiser (oastworkshops@gmail.com ) if they have not received a receipt within two weeks of submitting their booking. Members should assume they have a place on the workshop(s), unless they hear to the contrary. The list of confirmed attendees will be available on the Oast Facebook (Events) page (a ‘closed’ group for members only) with the names of any on the waiting list. The list of confirmed attendees with the names of any on the waiting list will also be available at the workshop booking table at Oast Meetings. Confirmed attendees will also receive an email reminder two weeks before the workshop, which will also confirm the location of the workshop. The Oast website and the Facebook page will also update members with the status of the workshop alongside the requirement details indicating whether spaces are still available. In the event that a workshop is oversubscribed, Oast will endeavour to arrange additional dates that members may be offered. If that is not possible, then places will be allocated on a ‘first come, first served’ basis. If a member is informed that they do not have a place, their name will be retained on the waiting list (in order of booking) in case there are any cancellations. Ultimately if a member is not successful in securing a place then the fee will be refunded in full. If you have to cancel your place on a workshop, Oast will endeavour to ‘sell’ the place, in which case your fee will be refunded. The place will be ‘sold’ to the next name on the waiting list. If there is no one on the waiting list and you have a friend who would like to take the place, please let the Workshop Organiser know. It is vital that the change of name is notified to the Workshop Organiser. If Oast is unable to sell the place, you will not have your workshop fee refunded. However, if there are exceptional reasons for your cancellation, please contact the Workshop Organiser who will liaise with the Committee regarding a refund of the fee. We strongly recommend that all electrical equipment brought to workshops (sewing machines, irons, extension cables) should be PAT tested annually. Tea and coffee is provided throughout the day of a workshop, but members should bring their own mug, a packed lunch and an extension cable. A UFO day is held periodically throughout the year when you can bring your unfinished pieces to work on may be get some advice or to just share a sewing day with like minded people. Coffee and tea provided, but please bring your own lunch. The day is held at Lower Hardres Village Hall. For inspiration visit the Student Gallery at www.kareneckmeier.com The workshop will focus on the techniques of Karen Eckmeier from her book “Happy Villages”. Participants can use her inspirational ideas to create their own picture of an imaginary happy place or may prefer to produce a small work of art using a real reference that makes them happy, perhaps from a photograph, using her techniques and a little artistic licence. It will be fiddly but fun and bounded only by your imagination so bright and beautiful or cool and calm, the choice is yours so choose your fabric accordingly. We’ll aim for a piece about A4 in size for this workshop, though the adventurous could go larger. Save all your tiny pieces of fabric for roofs, windows, doors and steps which can be as small as 1/8″ x 1/2″! Flat surface on which to build your picture eg cutting mat so you can move it easily! This workshop will allow you to make liberated blocks, such as wonky star, asterisks and woven blocks or guide you to make your own improv blocks. You will also learn to make portholes to frame your blocks. You will be able to achieve great results in circular walking foot quilting. Background fabric – 1.5 metres, I suggest that you use a solid colour or a tone on tone fabric for this. Porthole fabric (Improv Blocks) – I used scraps of solid colours for an improv look. Scraps or fat quarters of fabric of your choice will be fine. Also you could use novelty fabrics or floral fabrics which can be fussy cut to fit the portholes. A couple of fat quarters should be enough for this. Lining fabric – 1 metre. I suggest a good contrast to your background fabric, black or white works well. Circular templates – you can borrow mine on the day if you don’t have any. Sewing machine with a quarter inch foot, open toe applique foot and a walking foot. Topstitch sewing machine needles size 80. Fabric scissors, pins, pencil, piecing thread in a neutral colour, quilting thread to match your background fabric. Cutting mat, rotary cutter, 12 inch square ruler and 6 x18 or 6 x 24 ruler. Wadding, backing fabric and binding fabric to fit the size of your quilt. (This will not be required on the day). We will be practising circular quilting on the day. For this practice piece you will need a fat quarter, a solid colour would be good, wadding and backing of the same size or a little larger and quilting thread to match your top fabric. 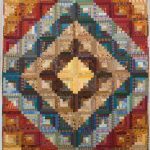 This project appeals to both traditional and modern quilters and is suitable for quilters of all levels as successful designs can be created from simple patterns or more challenging ones. 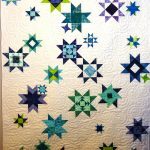 Create a unique constellation by making your choice of star blocks in different sizes and scattered in your own design across the quilt top. We will focus on ways to improve accuracy, so that the small blocks look good, as well as providing lots of star designs for inspiration. A great variety of fabric styles and colours are suitable. The workshop sample measures 44” x 60” but a quilt of any size can be created. This would make a great shared project! PLEASE NOTE: The fabric quantities given should be enough, but it depends on the density of the stars in your quilt and how frugal you are when cutting fabric. If you are worried, please buy an extra half yard. Otherwise, choose a fabric that is readily available (e.g. Kona plain) or go scrappy and use a variety of background fabrics. 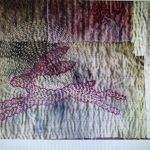 I used batiks in cool colours for my quilt, buhttp://oastquilters.co.uk/wp-admin/edit.php?post_type=paget feel free to use scraps or fat quarter packs, or Christmas, or Civil War, or juvenile fabrics – the choice is endless! Usual sewing equipment, sewing machine, extension lead, etc. If you have special rulers for cutting star points (e.g. Tri-recs) and/or a flying geese ruler, please bring them. If you have specific star block patterns you would like to include, please bring directions with you (and you could do some pre-cutting). In this workshop you will use the soft colours of naturally dyed fabrics and threads. 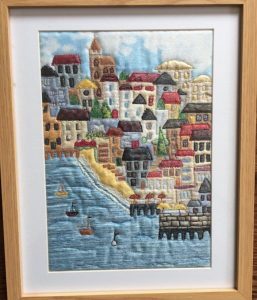 This day is all about learning how therapeutic and relaxing hand stitching can be whilst creating your very own masterpiece. You will learn about traditional quilting stitches, kantha quilting, Japanese Boro and patchwork techniques. The combination of cottons, silks and linens with varying thickness of threads will give endless design possibilities. You will be able to continue stitching into your work after the workshop. your cotton muslin with overlapped seam allowances. A mix of both works really well. * Needles to suit your threads that can be easily threaded. A range of patterns will be available for you to trace and use on the day. Jan teaches these workshops in conjunction: attendees can opt for one or the other and bring the relevant requirements. 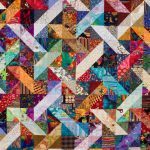 Scintillating Scraps: A modern take on popular scrap quilts designs, using strong shapes and colour. This workshop produces vibrant colourful quilts. Scrap Logs: Using traditional log cabin techniques, this workshop makes colourful, exciting quilts from lots of scrap fabrics cut into ‘strips for logs’. They are sorted into lights and darks, sewn around a centre square and then arranged into patterns. An easy constructive class. Lots of different fabrics sorted into colours and into lights and darks within those colourways. You can either work with a very colourful palette or reduce the number of different colours. Short strips will be used nearer the centre of the block and longer strips on the outside. Each log will be different, but fabrics can be repeated in different places in the quilt. Anything and everything will work, providing cottons are used. Bring a good selection of small amounts of mixed fabric in assorted colours with a good mix of light through to dark. Pieces of 6” to 8” square would be ideal to cut shapes from. Also strips of fabrics and fat quarters or eighths would all be fine. Please come prepared to swap with others in the class. Cost £5.00 to attend. Tea and coffee provided. Bring your own lunch. For further help, please contact the Workshop Organiser using the form below.